Mens dress shirt and tie sets are not only convenient but really make dressing your best easy to do. 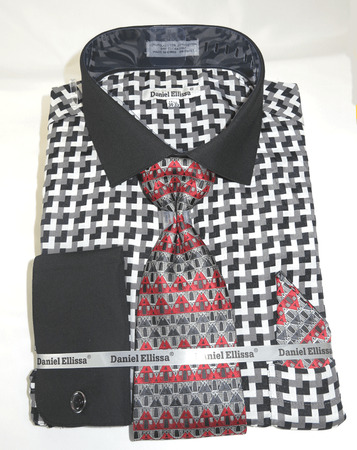 The Italian designers of Daniel Ellissa have take out all of the guess work of what tie will go great with the fancy pattern dress shirt like this black pattern dress shirt and tie set. This shirt and tie set here features contrasting unique black french cuffs and collar and comes with fancy tie set. Made of cotton/poly fabric.